Over the years I have seen many photos of the multi-coloured rows of tulips at Keukenhof and it was a dream for me to be going to see them. Fields and fields of rainbow colours stretching as far as the eye can see. A veritable carpet of flowers in every hue imaginable and a truly magical sight to behold. Actually being there and seeing them for myself was even more breathtaking than I could have imagined! Add to that the fact that we got to see the tulips at Keukenhof for free, made it even more incredible! 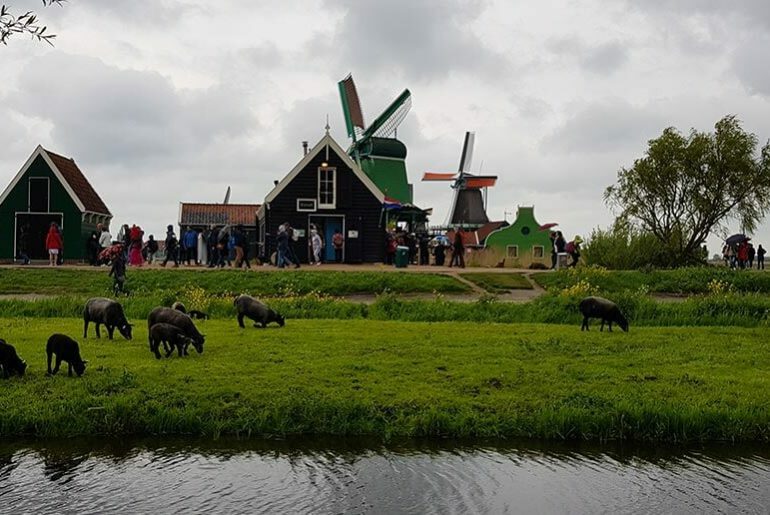 Keukenhof Gardens is world famous for its incredible tulip gardens and for the 3 months of the year that the tulips are in bloom, millions of tourists descend on Keukenhof to have a peek. Inside Keukenhof are formal gardens showcasing 7 million spring-flowering bulbs, all beautifully laid out in English landscape style. 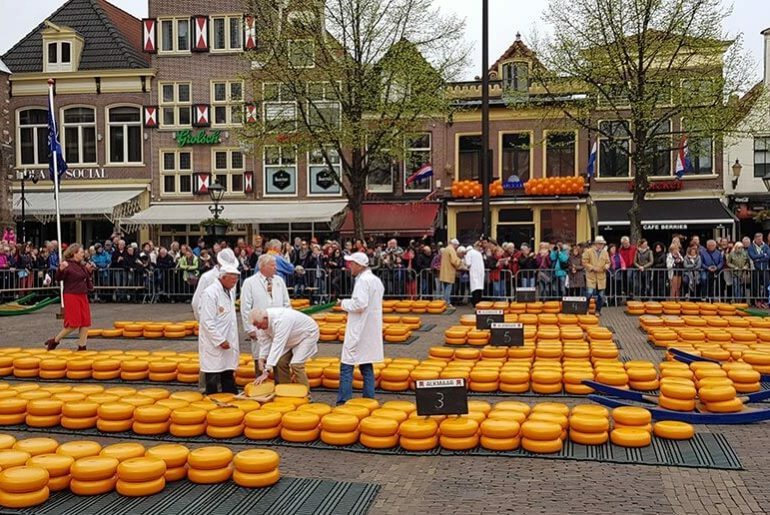 Along with the millions of bulbs in the gardens, there are also millions of tourists and I watched a massive amount of people going in and coming out of Keukenhof and the paths inside looked choaked to the hilt with tourists. Not my idea of fun, besides we had bicycles! For me, the big draw to Keukenhof was not to see formal landscaped gardens but to marvel at the magical fields of striped colours and the best way to see these is most definitely by bicycle. There is a place to hire bicycles if you don’t have your own. Keukenhof is also not the only farm to have tulips fields. Lisse is the centre of tulip growing in the Netherlands, so there are lots of private growers and thus endless neighbouring fields, bursting with tulips. We spent about 3 hours just riding around Keukenhof’s and other neighbouring fields. The rows of colours were incredible, from reds, yellows and pinks to purple, lilac and white. The horizon was a rainbow of vibrant colours. There were lots of signs telling people to please stay out of the tulip fields, but the temptation for Insta-worthy pics was too great and we came upon a group of people who had found a hole in the fence and were clicking away, so we parked our bikes and followed suit. It was really cold with an icy wind blowing, so when some girls stripped off their big jackets and had photos taken frolicking in the tulips in little summer dresses, I did have a huge chuckle. Anything for Instagram! We parked alongside a canal about 3km from Keukenhof, along with about 30 other campers. There were fields of tulips for as far as we could see. 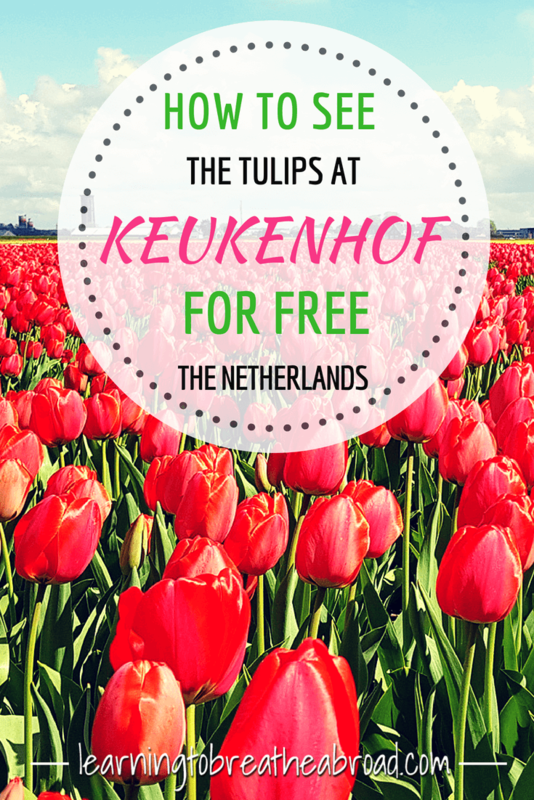 Visting Keukenhof to see the tulips is a bucket list item and a veritable feast for the eyes!